For every book I’ve written—or to be more specific, for every book that I have written and which has then been published (let’s not talk about those that don’t see the light of day)—there’s always something special for me as the author. Sometimes I’ve just tried something different and it worked, for instance High Five was my first book written in the first person. At other times it can be a character that I feel was realized especially well such as Clementina, an obstreperous seventeen-year-old who is simultaneously an adult and a child, showing absolute confidence while at the same time being totally vulnerable. Whatever the book, if it’s been published, you can be sure that in addition to me being happy with the story (and I’ve got to be really happy before the story even goes near the editor…) there are some things in there that I will like that you might not notice. There’s a lot I like about Bag Man. Leathan Wilkey is in his element—he’s being intuitive and intelligent in his approach; he’s taking risks but he’s still being cautious. But what I’m really pleased with is the ending. I’ve written about the ending in The Protagonist Fails and I know not every reader agrees with me about this ending—some have wondered whether the ending was intended as a set-up for another novel. The response here is simple: nope, Leathan just failed. This was a choice I made and was the story that I was trying to tell. I like the ending because, ultimately, Leathan is right, and yet he still fails. There is an ambiguity and something of a contradiction. On one hand, Leathan’s intelligence and intuition were absolutely correct. However, the situation in which Leathan found himself led to a failure. That failure stings for Leathan and at the end of the novel we see him aiming to drink himself into oblivion to blot out that sting. One other aspect of Bag Man I like is the cover. It has a “vibe” that appeals to me. Light and dark. Street lighting makes the scene brighter, but it brings a contrast that makes the dark appear darker. Only with light are there shadows and the light destroys any night sight making the shadows seem darker. Urban. The scene is clearly shot in a city (in this case, Paris). Night. This photo is obviously shot at night, and night always has many attendant implications. Rain. As well as the wetness, the image also hints toward a certain coldness (and by the way, it was cold). Comparative emptiness. This is an urban setting, but there a few signs of humans actively present—there is a person crossing and car tail lights, but beyond that, the city looks empty. A photo brings together and presents those elements in a way that words alone cannot. It encapsulates several notions and presents them simultaneously. With words, there is an order in which words are placed on the page and therefore one element has to take priority over another. With an image, those elements have equal priority and it is for the viewer to decide where to look and to form their own opinion. And in combination, those elements give an overall impression which—to me—hints at something bigger. I love the photo that was used for the cover, however, the irony about that picture is that it was an accident. If you’ve been around for a while, you’ll know I spent some time in Paris researching for the Leathan Wilkey books, and as I researched, I took photos. 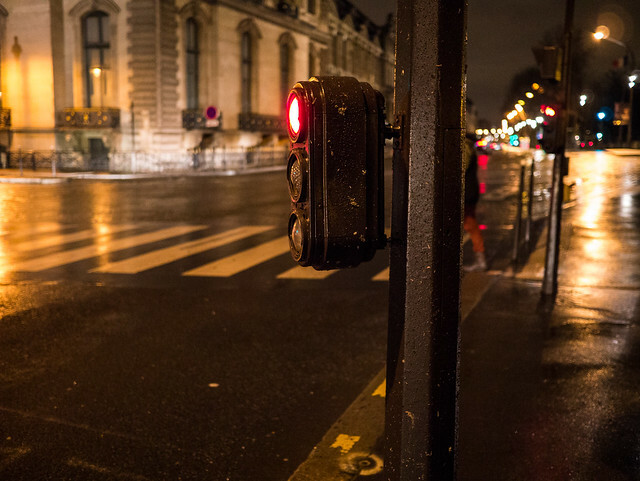 On my second evening in Paris, I was out walking—in the rain—when I saw something that struck me as being very typical of Paris: a traffic light placed at the height of the driver’s line of sight. Now this isn’t a crazy idea… In fact, it’s very sensible. However, it is a definite thing in Paris that isn’t present in London (where my Boniface series is set). In London, the traffic signals are placed on the top of poles—in Paris, this is the case too, but in addition there are these lower (and smaller) sets of lights. I had noticed these half-height lights and I wanted to remember this feature. However, it was raining and I was cold, and I didn’t want to take out my phone and tap away with cold wet finger and maybe drop the thing as I made a note. So I took a picture. I didn’t frame the shot—I simply pointed my camera in the general direction, hoped that the camera had focused, and hit the shutter. When I got home and looked at the image, I was surprised that I had actually captured something rather moody and quite evocative. Usually when it comes to creating a cover I give the cover artist some ideas. Often I’ll show them some images and then let them come up with some concepts. This photo was one of several I showed to the cover designer when I was trying to demonstrate the vibe I was after for the Paris books. It soon became clear that this image encapsulated much of what the cover was intended to convey and so rather than keep searching for another image, this photo that I had taken simply to be a reminder became the cover image. Of course, if I’d known this image was going to be used for the cover, I would have worked harder. For a start, I would have framed the picture better. If you’ve seen the wraparound cover used with the print edition of the book, you’ll understand the limitations of the original photo required some action. The image simply isn’t wide enough, so when the original image runs out, a mirror image of the photo has been added on the left-hand side. If you look at the crossing on the wraparound cover, you’ll notice it has an angle in it that isn’t present if you go to Paris. The other failure of the photo is that it doesn’t show the aspect I was trying to remember. Unless you knew, you may not realize that this set of lights was at the driver’s eye level—since I didn’t shoot the top light, there’s no perspective here. Despite those limitations, I still like the photo.